Dan Parr from Pro Football Weekly reports that now with Barrett Ruud gone, the middle LB job may go to Tyrone McKenzie. It wasn’t a surprise to see Barrett Ruud, the Buccaneers’ starting MLB for the past four seasons, move on and sign with the Titans. Ruud didn’t see the commitment he wanted from the Bucs, and Tampa Bay didn’t view him as a player they had to have. Deciding to give Tyrone McKenzie the first shot at becoming the new starter at middle linebacker, ahead of rookie Mason Foster, was a move few, if any, saw coming, though. 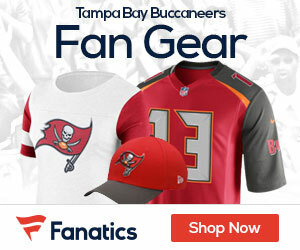 McKenzie, a second-year veteran, joined the Bucs’ practice squad last year after being cut by the Patriots and he played in three games for Tampa Bay. McKenzie appears to have a firm hold on the starting job, but we wouldn’t rule out a veteran free agent getting added to the mix. The Bucs want a player that’s comfortable in a leadership role at middle ‘backer and McKenzie is embracing the opportunity to take charge and make sure his teammates are on the same page. What is the running back situation?!?!?!?! I think Tyrone will be able to embrace the role of being the starter at MLB and taking the leadership role of the deffence that comes along with the job. I had the oppertunity to played alongside of Tyrone at riverview high school home of the sharks and had the oppertunity to see his raw leadership ability and talent before it was fine tuned in the next levels of his career and he had what it took then to get us guys who weren’t always on the same page to get to that point and unite the team as one to overcome our battles he’s a great guy who plays with a big heart. Can’t wait to see him trade some paint with our rival teams we face. Thanks , I have just been looking for information approximately this subject for ages and yours is the best I have discovered till now. But, what in regards to the bottom line? Are you sure concerning the source?